Both of these big bad boys were designed for NASCAR’s super speedways, the Ford SOHC in response to the Hemi, and the Hemi in response to the Ford 427 high-rise head wedge. The 1965 427 SOHC Ford at 7200 RPM on the Dyno in NASCAR trim. Funny. Both engines were built for the same reason, and perhaps not what you think. Both were designed for NASCAR’s super speedways, the Ford SOHC in response to the Hemi, and the Hemi in response to the Ford 427 high-riser wedge. One became the ultimate street killer motor and the other only powered drag race funny cars and rails – but both had huge influence on racing and performance. Back in 1963, Ford’s 427 wedge rose to speedway prominence when Henry’s boys put together an all out program to dominate that venue. From a moderately successful 390 and 406 cu. in. high performance motor, the “side oiler” 427 became noted for solid horsepower and reliability. As a result of the GM withdrawal from sanctioned circle track racing, it left only the Mopars to challenge them and they did not meet the test, with Ford winning the manufacturer's cup by taking home 23 victories in that year. Things were different on the drag strip, where lighter weight, a slick auto transmission and the 426 Wedge’s love for multiple carbs led them to dominance. As we’ve documented in our Ramchargers Series, Dodge and Plymouths owned the S/S ranks for that year. But the muscle car wars were yet to start and if you wanted the “win on Sunday, sell on Monday” mantra to work, you had to win in NASCAR. After the Superspeedway dust had settled in early ’63, Chrysler was looking for the answer. Tom Hoover, chief engineer responsible for Chrysler’s drag racing success, was asked if the B Series wedge could get it done. His answer was “no, but Hemi Heads are possible for that block”. He was given the green light to develop those heads (and the block, which was also recast to allow fitment). By late 1963 the Hemi was ready for testing and in full song, it broke a Chrysler dyno! Chrysler went on to dominate the 1964 super speedway races, proving its value as a race engine. Ford was stunned, and in response, they ginned up a new set of heads for their 427 – also with hemispherical combustion chambers, but with the valves actuated by single over head cams. Called “Ford’s 90 day wonder”, it was ready to go by late 1964. Where the Chrysler Hemi made 550 HP, the SOHC made over 600 and it could rev! When Ford went to NASCAR for approval, it was ruled that it was a “race only” engine not available to the public (not quite true, but at $5-10K per engine in 1964 dollars, no average Joe was going to buy one). After lots of back and forth in 1965, NASCAR told both manufacturers these engines would have to be offered to the public as part of a street package to be eligible. Thus, Fords won 34 races before NASCAR adjusted the rules to allow the Chrysler Hemi to compete, but it was too late in the '65 season for them to mount a championship challenge. However, since Chrysler’s design was more or less an adaption to their performance wedge, they knew they could comply and the Street Hemi was born in 1966. Ford, on the other hand, realized that the production cost of the SOHC would never allow it to be offered as an affordable package, so they folded. Now don’t cry tears for Ford, because they were able to squeeze enough HP out of the high rise wedge to keep it competitive on short track and even some speedways to satisfy management. 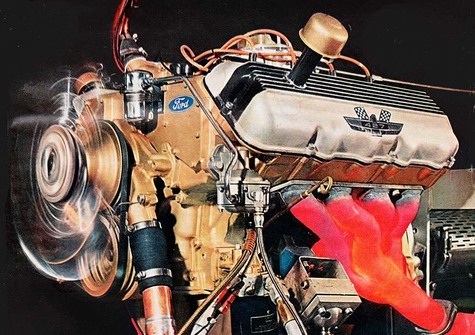 That high rise 427 engine was available to the public in Ford large cars – and believe me it was no slouch. In 1966, even with Ford withdrawing even the wedge in protest, they still won the manufacturer's title to Ford privateers, because even though Plymouth had 31 wins and Dodge had 18; both were considered different manufacturers, a rule that was soon changed. Ford had moved the 427 wedge out of the big car and into the Fairlane and Comet for 1966 and where it would race from then until replaced with the 385 Series 429. We all know the myriad of street and drag race combos that the Hemi spawned, but what happened to the SOHC? Well, its cost forced into the hands of professional drag racers in both AA/Fuel and Funny Cars, where it held its own, but it would never see street action. That said, it’s even more important to compare the two – so here we go. Let’s start by saying that the major magazines of the time researched the issue so we will be calling on them for reference – and we have those hard evaluations here – just click the links enclosed to read them first hand. Since both were primarily designed for superspeedways, the blocks are study pieces. Learning from Ford, Chrysler also cross-bolted the mains – easily done, since like Ford, the Mopar block was a deep skirt design. Due to the nature of where a Ford FE Series oils from, it is a “side oiler”, in that a special oil passage runs down the side of the block to feed the mains – directly from the oil pump. On paper, the block specifications are almost identical with bore and stroke within a hundredth of an inch of each other. Chrysler and Ford both ran a sturdy forged crankshaft. Both ran heavy duty forged rods mated to lightweight pistons, both have main bearing sizes and widths that are almost a mirror. And both blocks were proven to have survive the stresses of racing in wedge configuration, which they went on to do so in this new design. Ford actually used a pushrod 427 block with only an additional oil drain back at the rear, whereas Chrysler's Hemi was a distinctly different casting. As far as the combustion chamber size and design, both, once again mirrored each other: with the same size intake valve - with the Chrysler exhaust only 0.04” larger. Ports were huge on both and could flow sufficient air to make gobs of HP. BUT the Ford engineers went a step further, scrapping a pushrod configuration for overhead cams. Their reasons were twofold: first, more available rpms and second, less opportunity for failure due to fewer reciprocating components. Ford engineers were also unhappy with the potential angle of attack on the exhaust-side rockers if pushrods were used in the Ford block. This was later proven in that the SOHC ford had about 1,000 extra rpm available and also was able to produce more horsepower because of that. Whether that would have made a difference in actual competition will never be known. In available testing, the Ford engine made more HP in dual quad setup and was slightly better in single 4-barrel trim. But the Chrysler was far more race tested and was optimized at the point when it would have faced the Ford, which at the time was relatively untested. In 1964-65 the Ford’s extra rpms were yet to be utilized with existing intake manifolds; essentially wedge type merely modified to match up to the heads. We do know that in later drag race configurations, SOHC made about 100 HP more in unsupercharged configurations – confirmed by the Ramchargers. But to look at the heads from the piston side, the chamber seemed identical - they even had the same spark plug location. Both initially were cast iron, but later Chrysler Hemi heads were aluminum in race configuration. Ford used sodium-filled exhaust valves. Chrysler's ports were square, Ford's were round. The sad story is that Ford never really considered the engine for street use, and were hand-built, so acquisition costs were very high. It is said that even at the purchase price of a SOHC Ford, the company lost $1-2,000 per engine. Were it not for match racing and funny car competition, the SOHC would have quickly faded into obscurity, but in those venues it could hold its own and thus stayed in competition for many years. But if we have to pick a winner, we have to say that the Hemi gets the trophy, because it was made available to you and me – and powered a host of muscle cars for over 7 years. More significant is that you can still buy a brand new Series II Hemi from Chrysler! That alone speaks to its success. Deep Breathers - Car Life, July 1966. Best analysis of the engines, done when both had been track tested. Ford SOHC and Chrysler Hemi Tech Notes – Car and Driver, March 1965. This analysis was done on the release of the SOHC. Ford’s 90 Day Wonder – Hot Rod Magazine, January 1965. Extensive look at the SOHC on release. Chrysler Hemi Maximum Performance Engines Described – Factory description, January 1964. Detailed description issued on release. SOHC Magical Mystery Tour – Car Craft, May 1969. A look at the SOHC in race prep and trim by the famous Ed Pink. The specs, on paper, were almost identical, execution was vastly different. Ford's hemi head from the valve side Exhausts were sodium-filled. Chrysler head isn't much different. The top side of the Ford head is simplicity itself. Chrysler's head is a bit more complex. In 1964 the drag engine received a cross ram intake and the NASCAR engine did not - that was later changed - evening up some of the HP losses to the SOHC.